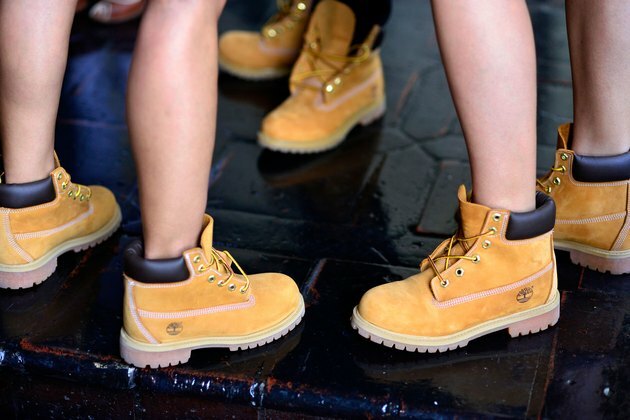 Timberland boots are an American classic that have been embraced as both a fashion statement and workwear necessity. But no matter why you wear them, it's likely that you'll eventually have to clean them. This usually calls for shoe-specific cleaning lotions or sprays. However, if you find yourself in a dirty shoes bind but are lacking these supplies, there are many basic household materials that can also get the job done. Remove small spots from the surface of your Timberlands with a gum eraser. Gently rub the problem area in a circular motion until it has disappeared. Don't press too hard since this could ruin the nap. Generously sprinkle cornmeal onto a greasy oil-based stain. Press lightly with your hand and let the morsels sit for a few minutes. Brush off when done. Cornmeal acts as a sponge and will soak up the oil. Wet down a clean cotton rag with white vinegar. Gently dab the surface of the boots where there are stains. Allow to dry. This method is especially effective on salt stains since the acid in vinegar dissolves rock salt pellets, but keeps the suede intact. Employ a toothbrush to quickly swipe away any minor dirt or dust. You can also use one to lift the nap after you've cleaned your boots, once they are dry. Simply stroke the brush lightly and quickly along the suede surface. Toothbrushes with firm bristles work best to loosen dirt. Squirt about a tablespoon of dish detergent into a small bowl and mix with lukewarm water until dissolved. Dip a clean cloth into the bath. Gently wipe across the surface of the leather until clean. Pour one part lemon juice and one part cream of tartar into a bowl. Blend until mixture becomes a paste. Dip a cotton cloth into the solution and wipe it across the leather. Let the solution sit for a few hours and then wipe away with a dry cloth. The acid content in the solution cleans stains, while the light grainy texture buffs the leather without damaging it. Rinse a bar of moisturizing body soap under running water until it becomes wet and lathery. Wipe it down with a wet cotton cloth. Using a circular motion, wipe down the surface of your boots. Allow to dry. Your boots will not only be clean, but also soft and conditioned thanks to the moisturizing properties of the body bar. Swipe a fresh baby wipe across the surface of your Timberlands to remove light dirt and enhance the shine. The cleansers are gentle and effective on leather hide. Eliminate the build up of dirt and mud in the treads with a pencil. Push the back rubber eraser end -- not the point -- through the sole's grooves, digging through the muck and breaking it up. Once you are done, shake the boots to let any of the loose dirt fall out. Roll up one or two dryer sheets and place them inside your boots. Leave them to sit overnight. This will freshen up any the insides of your boots, which can develop an unpleasant smell over time. Mix equal parts baking soda and dish soap in a small bowl. Remove the shoelaces from the boots and place them into the bowl. Scrub them with a toothbrush to loosen any dirt. Allow to sit for five minutes before hanging them to air dry. Always remove the shoelaces before cleaning your boots. When air-drying leather Timberlands, keep them away from a direct heat source -- this can dry out and crack out the hide. P&amp;G Everyday: Discover Simple Cleaning Tricks for Tennis, Suede and Leather shoes.